There are several things I love about the Kindle. First, it's a dedicated ereader. Technically, there are now other things you can do on your Kindle. I find with my iPhone or my iPad, if I sit down to read, I'll find myself checking email or playing Angry Birds a few minutes later. When I pick up my Kindle to read, I just read. Second is the form factor. I have an iPad and reading on it is OK. But, after a few minutes, it gets pretty heavy and it's not easy to hold with one hand. The Kindle was made to fit in your hand and be easy to use one handed and for extended periods of time Third is the visibility. While the contrast is not as good as ink on paper, no matter what they tell you, the contrast is pretty good. I can read my Kindle in pretty low light. Better yet, I can read my Kindle outside in full sunlight. And, I don't get eyestrain from reading a backlit screen like I would with my iPad or another ereader with a color screen. I love the fact that my Kindle is e-ink, not backlit. Lastly, I love the ease with which I can download books, store books and sync between all my devices. My first Kindle has 3G connectivity. So, I can actually buy a book anywhere I can get a cell phone signal. 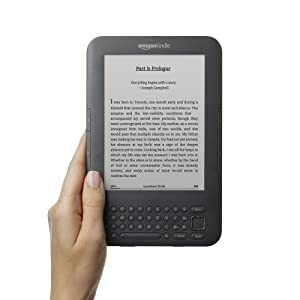 To save $50, my second Kindle is WiFi only. But, I can still get a book downloaded to it in less than a minutes on a WiFi network. My first Kindle I attached to my computer a few times when I was messing around with trying to read PDF files on it or something. My second Kindle has literally never been attached to my computer. Everything I've ever done with it has been wireless. Amazon keeps a permanent archive of every book I've ever bought. So, I can choose whether to keep it on any of my devices or not and easily retrieve it if I want to reread the book. And, if I'm sitting somewhere and want to read a few pages on my iPhone or I've got the iPad with me and my Kindle is somewhere else, I can open up a book I was reading on the Kindle and sync right to the page I was on on the last device I was reading on. p.s.- there is something I should add. The Kindle is both a hardware device and a platform. Since Amazon has put out Kindle software for the PC, Mac, iPhone, Andoid, iPod Touch, etc., etc. You can get most of the functionality of the Kindle without actually owning the Kindle hardware. I use my IPad for my reader. I just downloaded "Walden" and want to start it soon. Not matter where I read, I always seem to have two or three books going at the same time. That's how my new series of posts got started, reading two sources at the same time. So many books, so little time!